Napier is this wonderful little town in the middle of the Overberg at the foot of the Soetmuisberg. The unobtrusive town sign on the far side of the village proudly indicates that it’s 266 feet in altitude. Until recently it was only a blip on the map and somewhere I had heard was worth a visit. It’s funny how that altitude thing plays with the mind, because in hindsight most of Napier rests on a slope. And the road through town has a rise and fall about it too. Put it this way, it definitely isn’t flat in Napier. Not that this unimportant fact has anything to do with the lovely town, which has become popular with artists and artisans who have moved here to escape city living. As far as geography goes, Napier lies really close to another Overberg town – Bredasdorp – they’re about 20 kilometres apart. 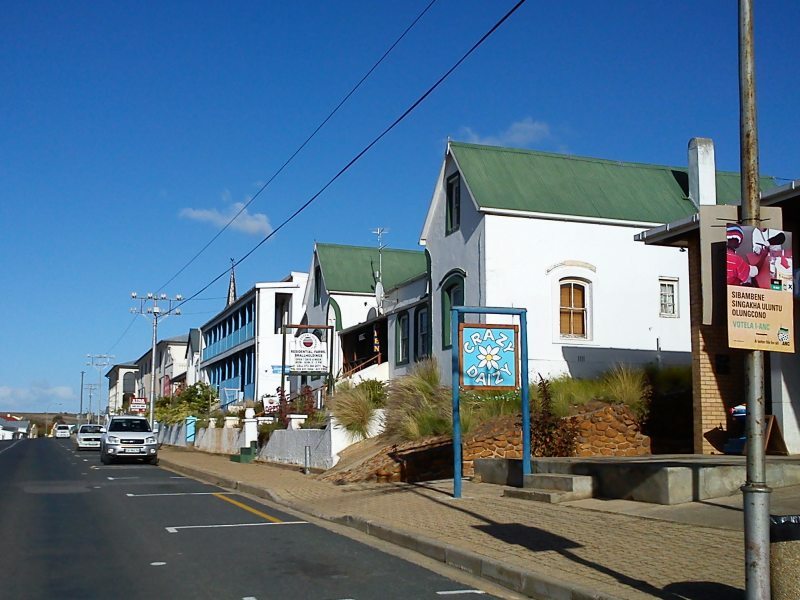 And both towns market themselves as the ‘gateway to the southernmost tip of Africa’. 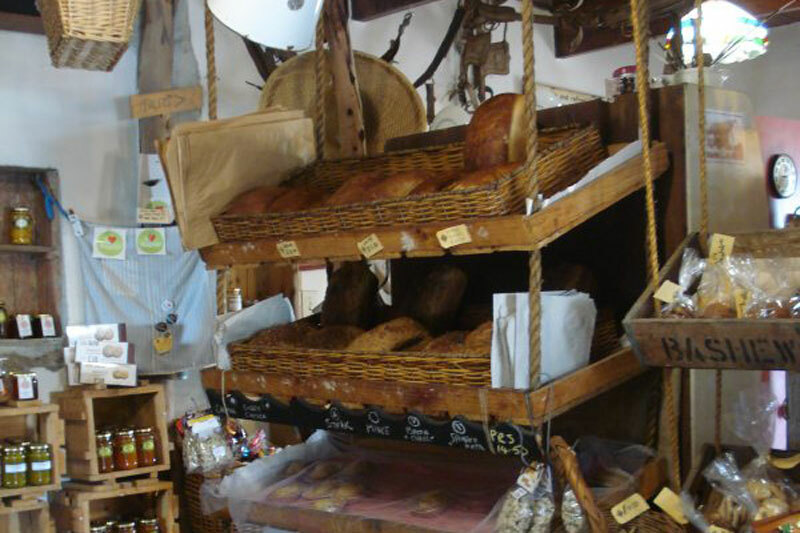 They may as well get it in as soon as they can (and they do, with large ornate boards), because by the time you’re in L’Agulhus, everything is ‘southernmost’ – be it a pizza joint, bakery, B&B or butchery – and they make no bones about claiming such. The town could rename itself ‘Southernmost’ and no-one would be surprised. The rolling wheat and barley fields that accompany one in and out of Napier, the old world charm of Napier itself complete with old style cottages, some of which have been restored, along the main road and above the town, the narrow little lanes and pretty vegetable gardens, make it a wonderful space in which to be and hence a popular town to visit. There is something particularly inviting about Napier, especially as it is only about two hours’ drive from Cape Town. As with many South African dorps the NG church is rather prominent, but this one has a different style of architecture, which I later learn is because it is built in the form of a Greek cross and its interior houses an exceptionally beautiful pipe organ. It rests at a rather prominent spot in town in amongst other attractions, like the gallery (look out for the baobab style tree out front) with an incredible second-hand bookstore on its back veranda, Hero Stained Glass, the Toy Museum, the Instap Minimark and a few very bright and inviting restaurants like the Good Food Café and Pascal’s. 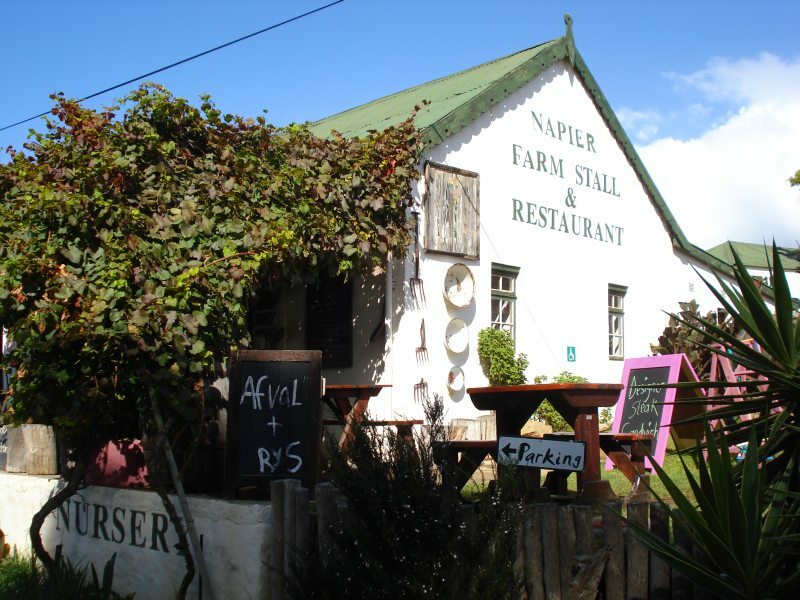 But we pull in at the Napier Farmstall, virtually en route out of Napier. I’ve heard that it is worth a visit, and I’m not disappointed. The first thing I notice is the rather subtle-dig-in-the-ribs Spur menu as I ascend the stairs. But it takes me a while to decide whether the chain restaurant is desperate enough to advertise at Napier’s farmstall or whether owner Ilze Vos just has a rather wicked sense of humour. I decide firmly on the latter after meeting her, when I get the distinct impression that she thinks my snapping photographs inside the stall means I’m trying to steal some of her suppliers. I can understand why. Ilze has run her farmstall for thirteen odd years. 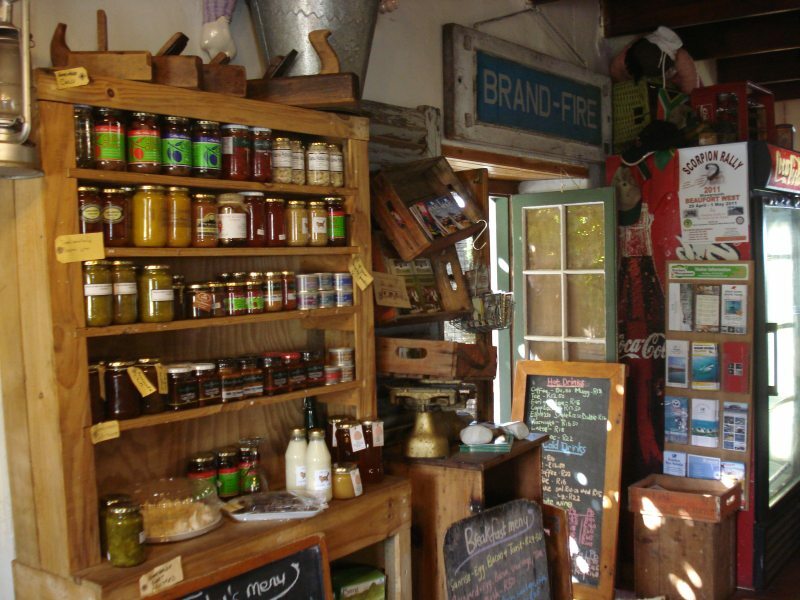 She has seen other farmstalls come and go, and distinguishes herself from many of them by the care with which she stocks her shelves – you won’t find stuff here that you can buy at Pick n Pay. Ilza has hand-picked her suppliers, providing space to local and unique products that you won’t find here, there and everywhere. 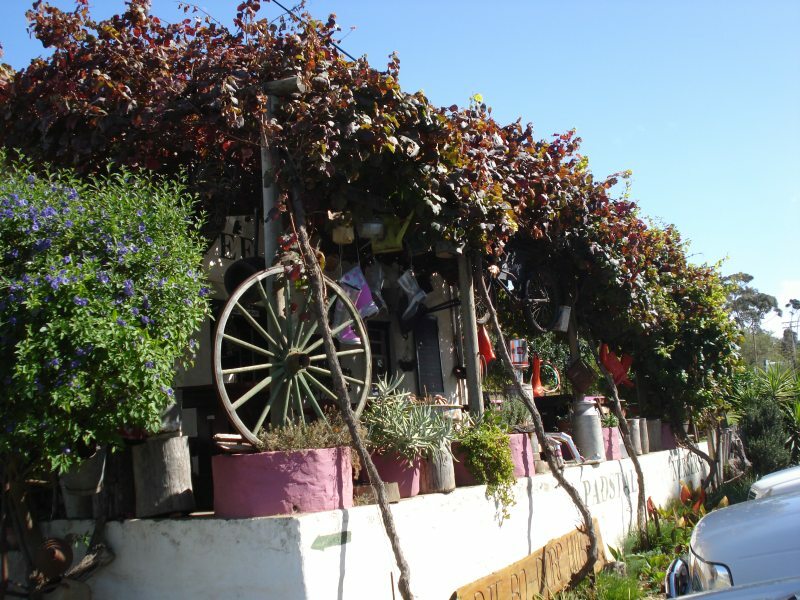 The secret with the Napier Farmstall is to take the time to look around. Because it can feel a little like sensory overload when you first walk in. The space in which you find yourself is small. Angularly arranged wooden tables, bicycles, shelves filled with enticing products, bread baskets overflowing with just-baked in the oven out back signature country-style loaves (one of which I quickly nab before they all disappear), pitch forks, picture frames, storm lanterns and blackboards advertising today’s fare all jostle for your attention. And people keep pouring in. It’s a rather windy, cold day for April, hence most of us are forced to sit inside. Usually the tables and benches outside are more popular, but I’m more than content to savour my homemade chicken soup (literally made for the soul) towards the back of the shop. There is still space in which to manoeuvre and Ilza is a wonderful hostess. People are seated easily and quickly, food appears as if by magic, music plays softly in the background, and everyone’s happy. 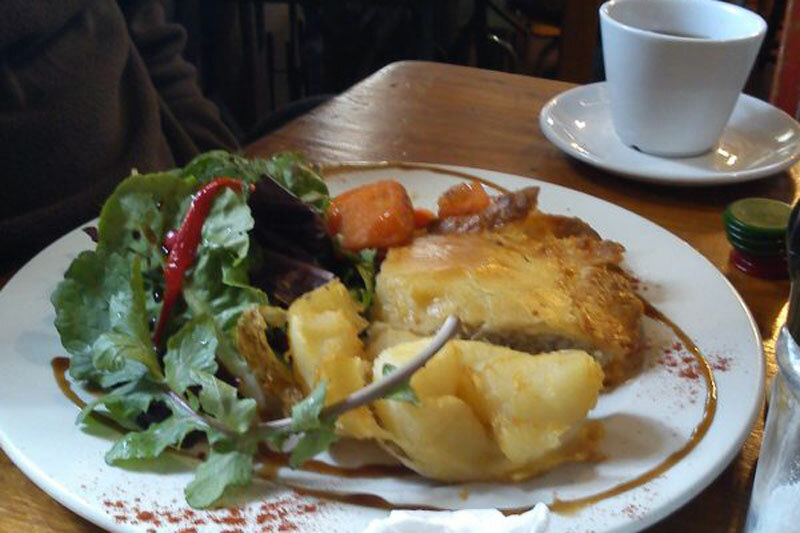 Our chicken soup, served with homemade country-style bread, and the chicken pie are exceptional food. It is not often that you taste real home-style food, so that when it comes to eating it, it tastes as if your mother made it, but this food is exactly that. And on a cold autumn afternoon, there is nothing quite so good as chicken soup! And the bread is incredible. It’s safe to say that I’m a bread fanatic. I bake my own, and only buy from artisan bakeries. But this bread, despite being totally unpretentious, is delicious. Ilza tells me that they’ve now set up a bakery in the barn out back. “It used to function as a theatre, for a while, but that didn’t work, so now Daniel with a French surname, who is a professional patisserie, is using the premises to bake for the Biscuit Mill in Cape Town where he has a stall, and for the farmstall”. Although the bread is her original recipe, one with which she’s stayed, it’s been so good. As we chat the background music subtly gives way to the day’s live jazz performance, played on both a violin and a muted trumpet, by a thoroughly laid-back musician with a hole in the knees of his jeans, who, when he catches your eye, mumbles the title of the tune he’s about to play and smiles whimsically – it’s rather endearing. You get a lot more than just a meal at the Napier Farmstall, that’s for sure. Other tempting mouthfuls you can find at the Napier Farmstall: jams, honey, vinegars, oils, any number of preserves, home-made quiches, pies, meringues, and to-die-for eclairs supplied by someone local in town.